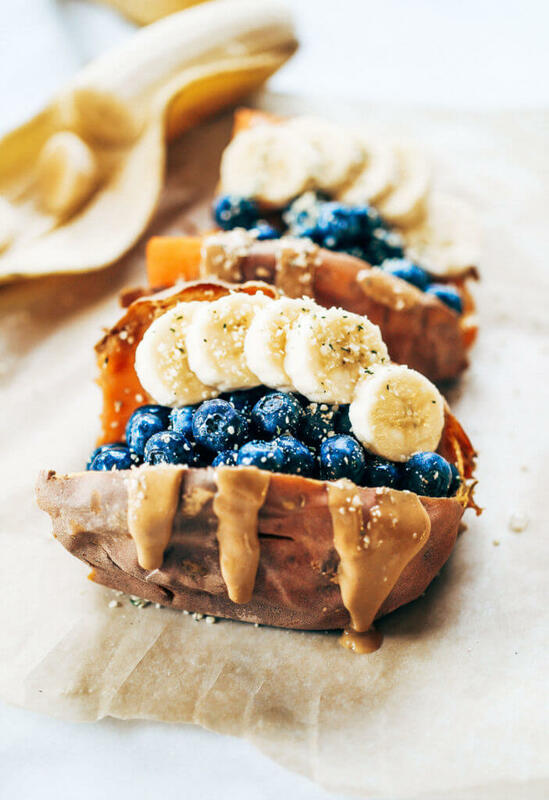 Baked sweet potatoes stuffed with blueberries, bananas, and cashew butter. This easy paleo whole30 breakfast is perfect for meal prep; make ahead and eat throughout the week! Okay, guys. I did something completely new and out of my comfort zone today. Due to all the video requests, I shoved off on a new venture and pulled together a quick (not fancy!!!) video of me making breakfast today. Keep scrolling to watch the process! This breakfast has been my staple lately and it’s mind-blowing how something so simple and easy to make is also utterly DELICIOUS. I love mixing my fruits and vegetables together at every meal. Nothing makes me happier than a big plate of rainbow colored produce. The broccoli mixing with the mangos doesn’t bother me. This combo has me completely hooked; you need it. 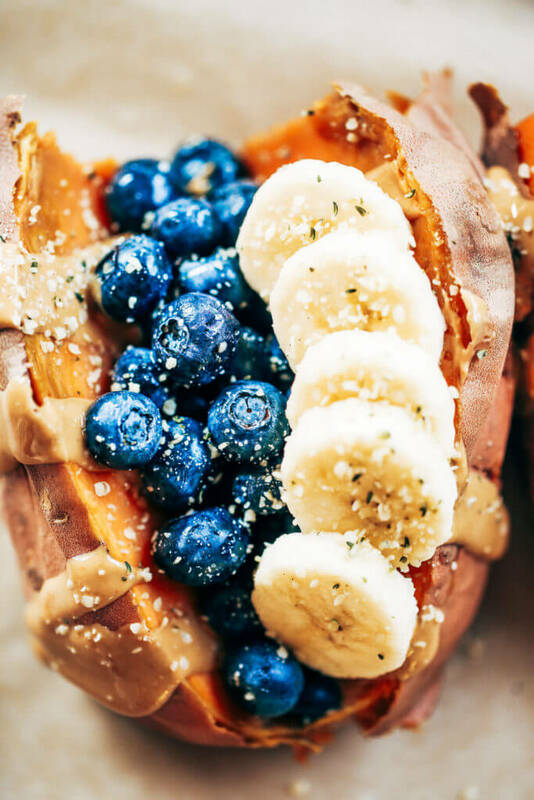 The sweet potatoes mingling with the creamy nut butter and fruitiness is ah-mazing. I love to use Trader Joe’s creamy nut butter, because it’s all drippy and good. Also, I did this thing where I chopped up the sweet potato and mixed everything together with some milk and made the best breakfast cereal! Watch the video below on how I did it. It may look like slop, but I promise: it’s the best. I’m going back for seconds at lunch (good thing I saved half for later 😉 ). 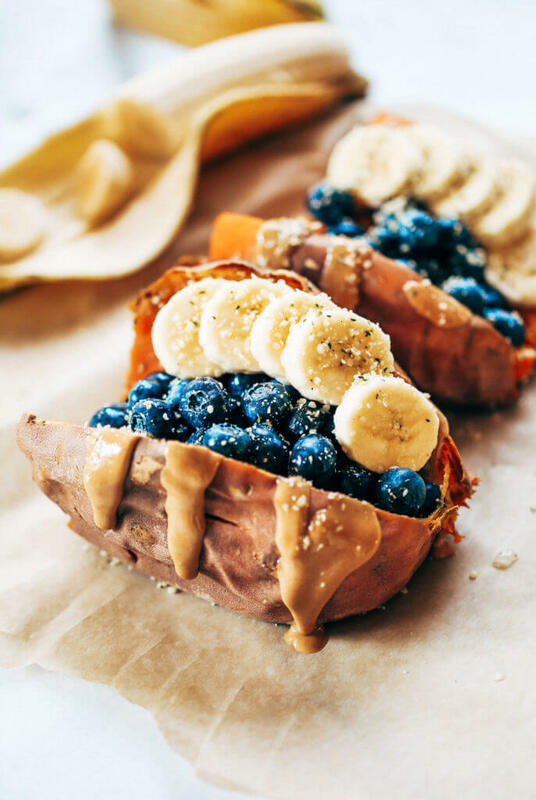 Stuffed Sweet Potatoes For Meal Prep! There literally couldn’t be anything easier to make for meal prep! If you’re looking for healthy eating options in the mornings that doesn’t take ages to prep- this is your recipe. 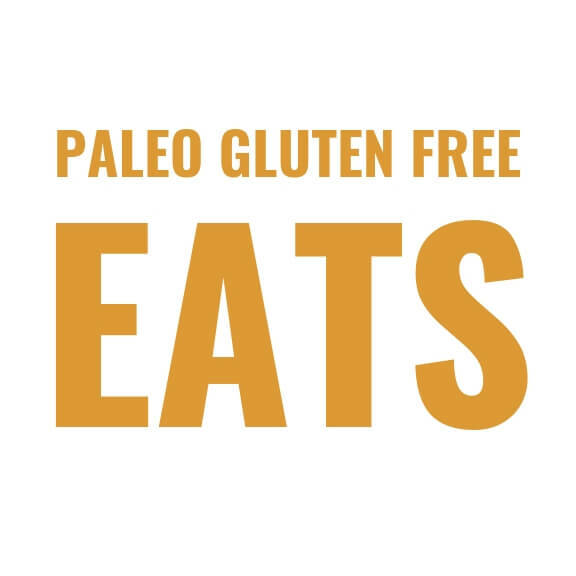 These kind of recipes make paleo/whole30: LIVING. 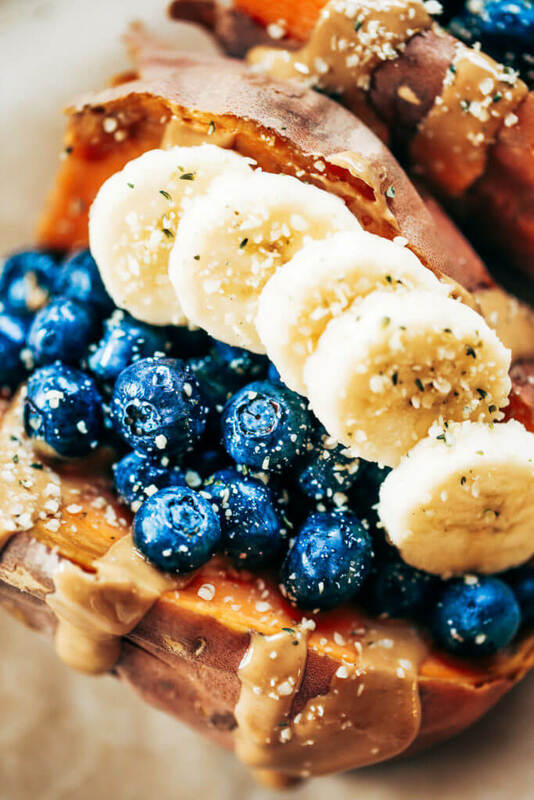 I feel like a queen eating a bowl of this sweet potato breakfast goodness. If you decide to bake your sweet potatoes ahead of time, store them in these glasslock containers until future use. They will stay fresh and tasty! How to make baked sweet potatoes: poke sweet potatoes with knife in various spots, then place on oven racks. Bake on 400F until soft (about 50 minutes). 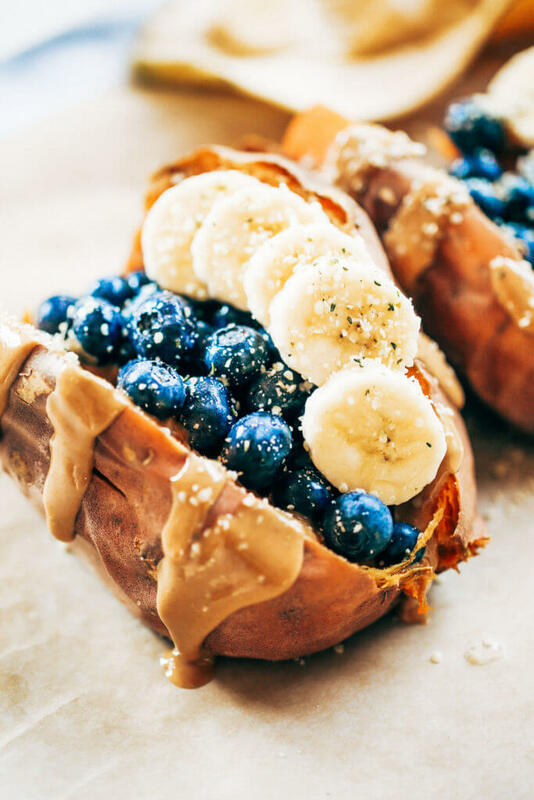 Slice sweet potatoes in half, drizzle with cashew butter, top with blueberries and sliced bananas. Then sprinkle with hemp hearts (or chia seeds or chopped pecans) and sea salt flakes, then serve. 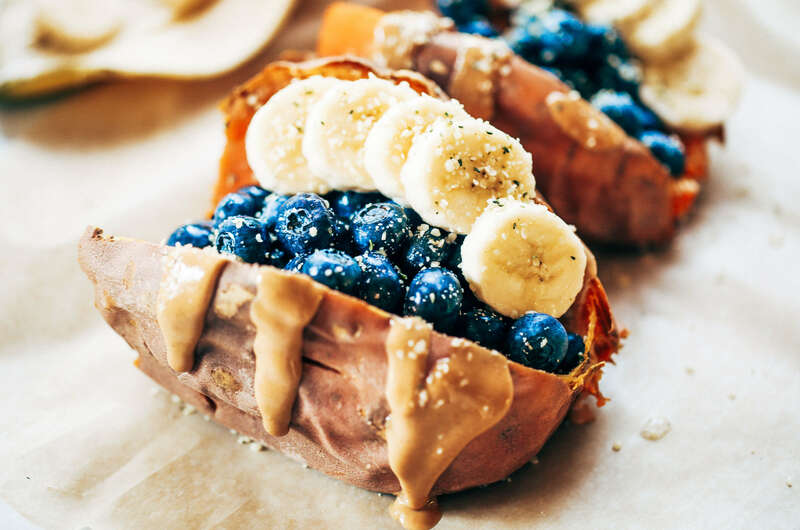 You can bake sweet potatoes ahead of time for meal prep (store in fridge) and serve throughout the week. This is actually a great idea! It’d be a nice little meal to start the day, it wouldn’t be a heavy to make me feel sluggish either. Thanks for sharing! Oh wow that looks really delicious! Going to make this recipe SOON. Thank you!